Stay refreshed yet warm and comfortable when in action on the training pitch with the Nike Squad 1/4 Zip Long Sleeve Midlayer Training Top in Binary Blue and Industrial Blue. 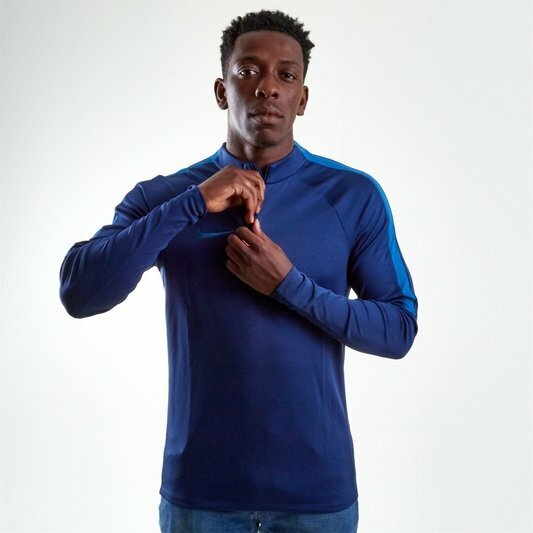 This long sleeved midlayer training top from Nike is designed for chillier outdoor training sessions and includes a quarter length zip up collar for ease of access. Thumbholes on the sleeves also allow for a comfortable glove-like fit. Made from polyester and elastane material, Nike Dri-Fit technology in this sweatshirt ensures the wearer stays feeling drier and more refreshed as they exercise by drawing moisture away from the skin and quickly evaporating it. Perfect for practice sessions and various forms of fitness training and exercise, pull on the Nike Squad 1/4 Zip L/S Midlayer Training Top to enhance your performance.